The Bliffen-buppels were just about to lose their home to foreclosure. They were perched to move the following day, intending to take their two children and move into a rent-by-the-week motel. Heavy-hearted, Mindy and Ted took one last look around the two-story townhouse they’d purchased ten years earlier, now almost entirely empty. Although the walls were free of ornamentation and the furniture had been put in storage, the cozy carpeting and warmly painted walls still evoked the feel of a cozy hearth. They looked at each other and sighed, sinking onto the banquette which they’d built in front of their living room bay window. Hearing their kids laugh from the TV room made them feel a little lighter. Mindy screwed up her face. She looked out the window, taking in the stand of dwarf palms they’d purchased two years earlier, now almost three feet tall. The memory of happier times gave her a drip of hope. “It’s pronounced Al-iolio’s,” Mindy corrected him. “Silent ‘g’.” She had worked as a translator before the kids were born. As Ted opened the car door for Mindy, he noticed an orange hibiscus growing next to the driveway. The kids climbed in the back while he plucked it. He climbed into the driver’s side, and turned towards Mindy. “May I?” he asked placing the flower in the buttonhole of her work shirt causing her to smile. Arriving at the elegant restaurant elevated their mood. They sat and perused the menu. The children had been clearly told that they had the choice of ordering either an entrée or a dessert. Not both. “Can’t we have pasta and also maybe just one itsy bitsy dessert split between us kids?” whined Linda, the eldest. At fifteen her hormones were raging, and her appetite was bottomless. “Okay then, let’s make it an even four!” sang Mindy, shutting the menu. “Happy to meet you, and you family!” said Mr. Wellson, then walked towards the exit. “Did that really just happen?” asked Ted. “Yup!” sang his family in unison, then giggled. 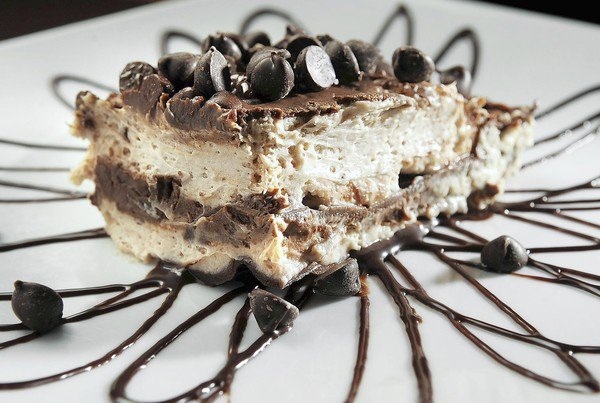 When the waiter delivered the chocolate lasagna he informed them that Mr. Wellson had bought their dessert for him. It was sumptuous. The most decadent dessert they’d ever had. “Wow, he’s real!” yiped Ted. Mindy placed her hands in prayer position. “I believe in goodness!” she purred. Let’s jump ahead to after the Bliffen-buppel’s new mortgage had been established under Mr. Wellson’s supervision at a much lower rate then they could have even imagined. They were out celebrating at Agliolio’s. Dining at the divine Italian establishment had become a monthly habit. They made a point of always having the chocolate lasagna, ordering it while speaking in a loud voice. And that’s how chocolate lasagna saved their home.